The "Pike", often known as the "Coney Island of the West", was a large amusement park on the waterfront in Long Beach, California. The pier was built on the waterfront in 1893 and by 1896 the strand was lined with horse-drawn carriages parked in front of the Joyland and Fairyland Theaters. In 1902, more than 60,000 people gathered to celebrate the start of Pacific Electric service from Los Angeles to Long Beach. The Red Car Line from Los Angeles ended at the Pike and as the Pike grew, it became a meeting point for the masses, drawing the largest crowd in its history with a beauty contest in 1925. As the years passed, the park kept pace with new and modern rides including a brand-new cyclone racer. Even so, it retained its old-fashioned air of the country carnival with fun for all, and no admission fee. Charles I. D. Looff, best known for building the first carousel at Coney Island in 1875, originally operated the Pike amusement center. Looff is considered to be the first of the great American carousel manufacturers, building 17 carousels for him and 40 rides in total (of which only 11 have survived). Today, a Looff hand-carved horse sells from $10,000 to $50,000. The World's Fair was held in St. Louis, Missouri in 1904 and a part of that exhibition was the "Pike." "The Pike was a street a mile long, solidly lined with amusements, more varied, more elaborate and more costly than any previous exposition had ever contained. When night came, and the exhibit palaces were closed, the throng was on the Pike. Everyone on the grounds, took a stroll down the Pike, to see the life and motion and color and light, to hear the bands and listen to the ingenious gentlemen whose wits were sharpened in the competition for patronage, and whose vocal powers, assisted by megaphones, vied successfully with the brass bands. It was an inspiring spectacle -- fifty or a hundred thousand people ceaselessly moving, the wise and the simple, the great and the humble, all pleased and happy, care-free and safe." 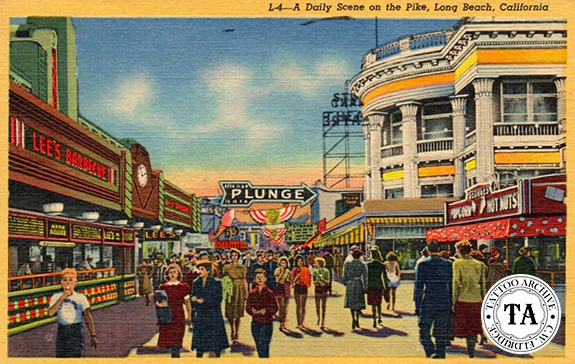 Walking down the main street of the Pike in Long Beach you would see arcades, shooting galleries, cotton candy, hot dogs, cafes, and a Ripley's Believe It or Not-type sideshow and other exhibits. It must have been like being at the Worlds Fair. It is safe to say that Charles Looff, being in the amusement business since 1875, was at the 1904 World's Fair in St. Louis or may have even had an exhibit there. Perhaps he was trying to create his own "Pike" in Long Beach. For 90 years, The Looff Building, which once housed a carousel and later a gaming hall, was open every day, every week, and on every holiday. It closed only once: July 1, 1918, the day Charles Looff, its master craftsman died. 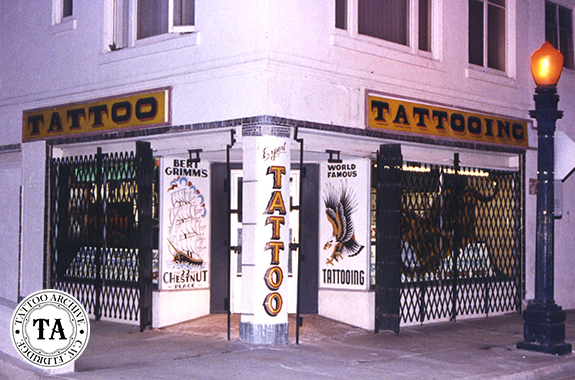 Throughout the years there was a lot of tattooing going on at the Pike. Bert Grimm ran its most famous shop at #22 Chestnut Street. When Bert left St. Louis in the 1950s he moved to this Chestnut Street location. Sadly by then, the Pike was already beyond its prime. Bert's shop at #22 Chestnut was one of the largest compared to many of the other shops at the Pike, which were like oversize closets.